HoloBuilder provides a lot of great features that we already explained in our previous tutorials. Today we are going back to the basics: this tutorial will show you the different possibilities to position, rotate and scale a 3D model in HoloBuilder because yes, there are more than one. How to position an object? How to rotate an object? How to scale an object? Some people just quickly want to, e.g., move an object to a location which simply looks good, others need their objects in exact locations. So just check out what the best positioning, rotating and scaling options are for you. 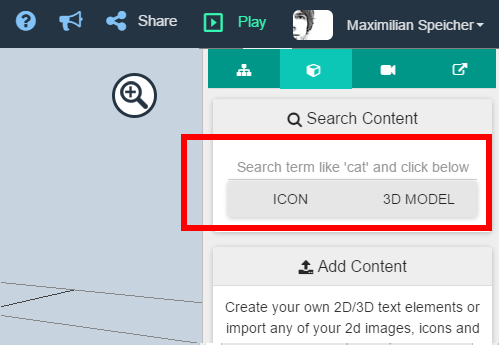 Note: If you don’t know yet how to add custom 3D models to your Holo have a look at the according tutorial or get a short introduction in ‘The definite guide to HoloBuilder‘. The tutorial is split into three sections, one for every mode. In every section, you first get a short explanation of the different possibilities to switch into the mode, followed by a list of options on how to position, rotate or scale an object. 1.1 How to get into the positioning mode? click on the position area in the interaction bar at the bottom of the screen. 1.2 How to position your object? Use the three arrows displayed at the object to move it on the three different axes. Just click on the according arrow and move the mouse in the wanted direction. Select one of the coordinates and enter a new value to move the object to the according location. Click on one of the coordinates, hold the mouse button while you move your mouse to the left or right and directly see the object moving accordingly on this axis. 2.1 How to get in the rotation mode? Click on the ‘rotate’-button in your work display. Click on the rotate area in the interaction bar at the bottom of the screen. Click on one oft he circles displayed at the object and move the mouse in the wanted direction to rotate the object around the chosen axis. Select one of the coordinates and enter a new value to rotate the object accordingly. Click on one of the coordinates, hold the mouse button while you move your mouse to the left or right and directly see the object rotating accordingly on this axis. 3.1 How to get in the scale mode? click on the scale button in your working display. click on the scale area in the interaction bar at the bottom of the screen. 3.2 How to scale your object? Click and hold the ‘scale’-button in your work display. Then move your mouse to the right/left to watch your model directly scale up/down. 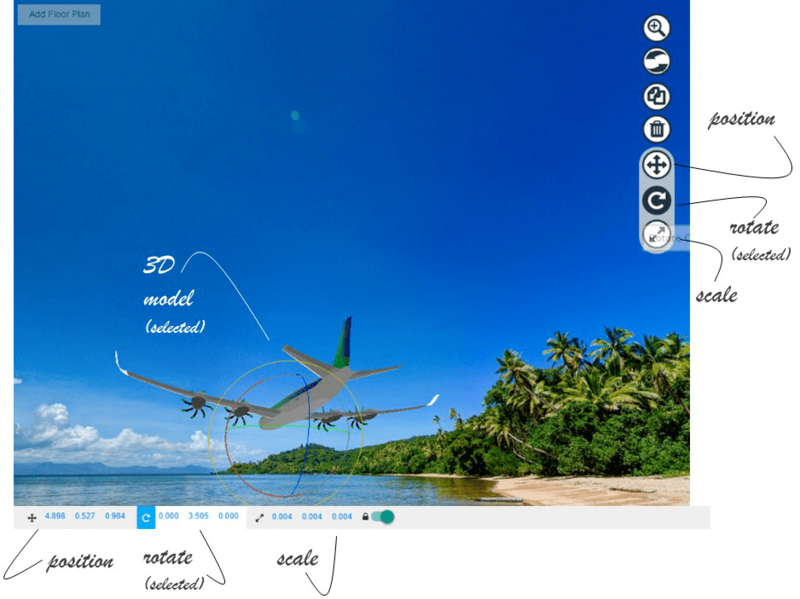 Click on any of the coordinates in the scale area, enter a value and watch the whole object being resized accordingly. 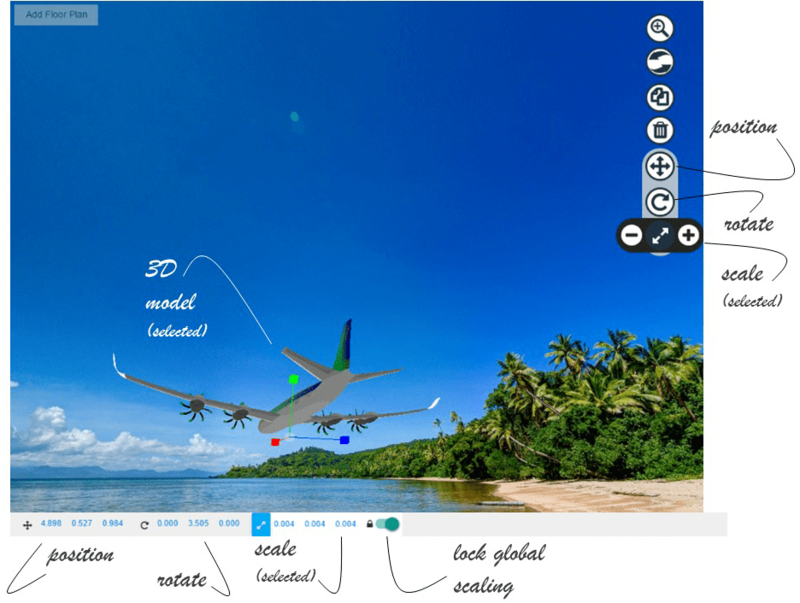 Click on one of the coordinates, hold the mouse button while you move your mouse to the right or left and directly see the whole object scale up or down. 3.3 How to scale only in one dimension? click on the axes or boxes displayed at the object to resize it in one of the three different axes separately. Simply click on the according line or box and move the mouse around to resize the object. toggle off the ‘Lock Scale’-button, to switch off the ‘Quick-Scale’ modus. Now click on one of the coordinates in the scale area, enter a value and watch the whole object being resized accordingly. toggle off the ‘Lock Scale’-button, to switch off the ‘Quick-Scale’ modus. 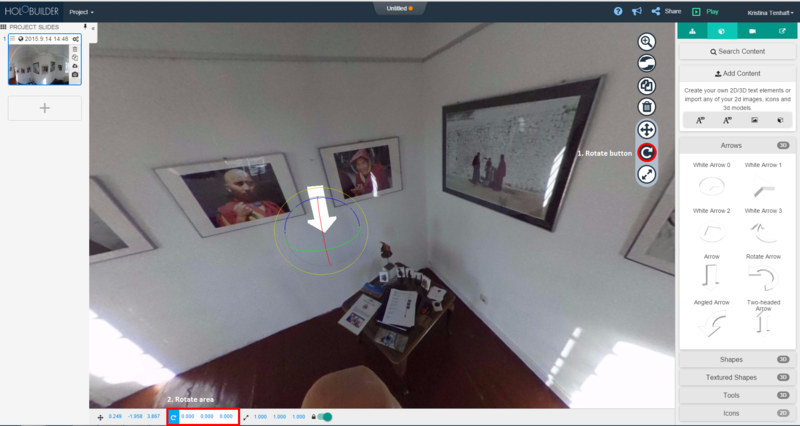 Click on one of the coordinates and hold the mouse button while you move your mouse to the right or left to directly see the object scale accordingly. Now you should know everything about positioning, rotating and scaling an object in HoloBuilder. Have fun trying out your new skills and let us know how the different modes work out for you. If you have any problems or suggestions please leave a comment or write us an email at support@holobuilder.com. This entry was posted in HoloBuilder Tutorials and tagged Feature, HoloTutorial, Position, Rotate, Scale. Bookmark the permalink. ← (R)evolution? New Ricoh Theta model S vs. m15: A comparative buyers guide.